Lambeth pupils vote for 2015 Winner on Election Day! Lambeth pupils voted on election day! Congratulations to Rob who has now won the Phoenix Award 2 years in a row! This exciting and unique South London based Book Prize targets Year 5, 6, 7 and 8 pupils in Lambeth, encouraging them to read through the transition years. Taking part this year were Public Library Chatterbooks groups, 3 primary schools and 9 secondary schools (Streatham Wells, Durand Primary, Streatham and Clapham High School Primary, La Retraite, Norwood, St Martin-in-the-Fields, Archbishop Tenison, London Nautical, Bishop Thomas Grant, City Heights, Lilian Baylis, Dunraven). Paul Bryers has confirmed that he will be attending our 2015 Finale event. "Delighted and honoured that Spooked - the Haunting of Kit Connelly has been shortlisted for the Phoenix Award - most particularly welcome to me because I've been welcomed at so many schools and libraries in Lambeth over the years." "THRILLED to announce that Spooked, the Haunting of Kit Connelly by Paul Bryers has been shortlisted by the wonderful librarians of Lambeth for the prestigious Lambeth Phoenix Book Award." We would like to thank publishers for their submissions (see list below). Special thanks to Lori Tait from Bounce Sales and Marketing for organising collections and contacting publishers. Pea Green Boat Books is delighted to take part in the Phoenix Book Awards at St Martins in the Fields School on 7th May 2015! To celebrate we will be offering 10% off all books by the shortlisted authors and previous Phoenix Award winners. Check the Finale Event information to find out which authors will be joining us to sign and personally dedicate their books. We are grateful to Dulwich Books for supplying the shortlisted books to participating schools for £20 per set of 4 titles. Please e-mail dulwichbooks@yahoo.co.uk or phone 020-8670-1920 and quote "Phoenix Award 2015". The shortlist for the 2015 Phoenix Book Award has just been announced. Please visit our website for full details. 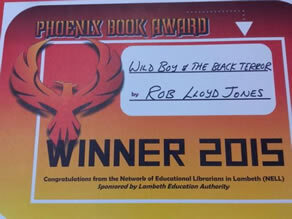 The 2014 Phoenix Book Award has been won by Rob Lloyd Jones, author of Wild Boy . Rob was present at our Finale event at Archbishop Tenison School on 1st May 2014. Many congratulations to Rob! A photo of Rob receiving his award can be found on our photos page. I'm ecstatic to hear about my Sesame's first award nomination - and to see that she's up against such worthy rivals. I hope she inspires many Lambeth readers to become supersleuths on rollerskates, as it's a pretty exciting career path and hardly perilous at all. Happy reading! The shortlist for the 2014 Phoenix Book Award has just been announced. Please visit our website for full details. The announcement was made on World Book Day 2013 at Clapham Library. Children’s author, journalist and theatre critic Lyn Gardner was interviewed by performance artist and literature consultant Sandra Agard. Certificates were awarded for Best Book Review and Special Effort. Some students produced video, performance and drama pieces based on the books read. This truly was a magnificent day enjoyed by all. Some photos from the event can be seen on our photos page. The shortlist for the 2013 Phoenix Book Award has just been announced. Please visit our website for full details. The winner of the 2012 Phoenix Book Award is Lincoln Peirce's Big Nate: The Boy with the Biggest Head in the World . Many thanks to Lambeth Public Libraries for hosting the event at Brixton Library, and to Sandra Davidson, Children's and Young Persons' Librarian, for all her hard work in the organisation of the event. Please visit our photo gallery to view photos from the event. Lincoln Peirce sent a special message to students who took part in the award and voted for his book. The timetable for the Phoenix Book Award has changed, so there will be no award in 2011. The 2012 shortlist has just been announced (Autumn 2011), and School Librarians and Teachers are busy preparing to take part. In January and February 2012, Lambeth pupils from years 6 and 7 will be reading, reviewing and discussing the books. In March 2012 we will be holding our Finale Event, with fun and goodies, and the VOTE for the winning book! These were selected by pupils from St Martin-in-the-Fields School Readers' Club and other schools from the 2011 "Booked Up" reading list. Pupils were asked to think about which books would appeal to Year 6 and Year 7 pupils, some of whom might be reluctant readers; which books would get these pupils excited about reading; and what could be a potential WINNER. Find out which of the shortlisted titles will win by attending the Finale Event to be hosted by Lambeth Libraries on World Book Day, 1 March 2012 - check back here for details or e-mail us via the contact page on our website. The winner of the 2010 Phoenix Book Award is David Walliams for the book Mr Stink . The winner was announced at the Finale Event at Lilian Baylis Technology School on 8th December 2010. The winner of the 2009 Phoenix Book Award is Frank Cottrell Boyce with the book Cosmic . Pupils from 10 different Lambeth schools read the three books on the shortlist this year, with more than 100 reviews posted on the website. The finale event was held on 9th December at Lilian Baylis School: 250 voted for their favourite book and a number of prizes were awarded by the Mayor of Lambeth to the best book reviewers. Thanks to Lambeth Public Libraries and Kids' Company, every student also received a free book. Photos from the event can be found on our Photo Gallery page. The winner of the 2008 Phoenix Book Award is Charlie James for Dino Egg . 250 pupils read the three books on the shortlist and many of them posted reviews on the website and attended the finale event on 9th December, which included voting for their favourite book, getting prizes for the best reviews and hearing from two of the shortlisted authors. Thank you to Barclays Bank for funding the 2008 Award and congratulations to this year's winner! A brand new website for the Phoenix Book Award has just been launched. Designed and built by Intexta Web Services, who have also been responsible for the Doncaster and Southwark Book Award websites, the new site enables pupils to find out more about the shortlisted books, submit their own reviews and give each book a star rating. It also provides information about the award for librarians, teachers and other education professionals. Charlie James has won the 2007 Phoenix Book Award for her funny, pacy debut novel Fish . Charlie attended the Finale event at Charles Edward Brooke Lower School and said she was delighted to have won the award. Fish has also been awarded the Fantastic Book Award by Lancashire School Library Service. 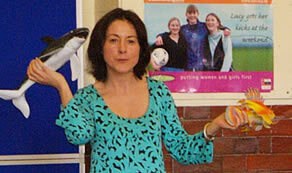 Charlie James's hilarious sequel to Fish , Dino Egg , is on the Phoenix Book Award 2008 shortlist. The 2015 Phoenix Book Award Finale event took place at St Martin-in-the-Fields School on Election Day, 7th May 2015. See our News section for the announcement of the winner, and our Photos page for a selection of photos from the event! The 2014 Awards ceremony will be kindly hosted at Archbishop Tenison School on Wednesday 1st May 2014 for participating students. Authors Christopher Edge and Rob Lloyd Jones have confirmed that they will be attending the ceremony. The 2013 Phoenix Book Award Finale Event will take place at the new Clapham Library on World Book Day, Thursday 7th March 2013, from 1 pm until 3 pm. The 2012 Phoenix Book Award Finale Event was hosted by Lambeth Libraries on World Book Day, 1st March 2012. The 2010 Phoenix Book Award Finale Event will take place at Lilian Baylis Technology School on Wednesday 8th December, from 10 a.m. until 12 noon. This year's finale event will see our students involved in a debate that will decide the winner of the Phoenix Book Award 2010 as well as involving them in a number of activities and challenges! The 2009 Phoenix Book Award Finale Event will be held at Lilian Baylis Technology School, 323 Kennington Lane, London SE11 5QY. Host Librarian: Barbara Ferramosca. Many thanks to Lilian Baylis School for organising and hosting the finale. Confirmed special guests at the finale include shortlisted author Frank Cottrell Boyce, shortlisted author Tanya Landman, and poet Chris Preddie. Local dignitaries will be invited. At the finale there will be prizes for the best reviews of the shortlisted books and a free book for every pupil taking part. The 2008 Finale Event was held at St Martin-in-the-Fields High School on 9th December 2008. The event included short-listed authors Catherine Johnson and Charlie James, who talked about their writing, and prizes for the best reviews from each school. The winner was announced as Charlie James's Dino Egg . The 2008 Phoenix Book Award was launched in schools in Lambeth during the week 20th-24th October 2008. The 2007 Phoenix Book Award Finale event took place in December 2007 at Charles Edward Brooke Lower School and was hosted by the Librarian, Angela Suter. Pupils from Lambeth primary and secondary schools gathered to enjoy hearing two of the shortlisted authors, Charlie James and Hazel Marshall, talk about their books. The pupils voted for their favourite to win and also enjoyed some food and presentations about the books from each group of pupils. La Retraite School Librarian Alison Bugg had worked with pupils from St Bernadette's Primary School to produce some beautiful artwork which we all appreciated. The winning book was announced as Charlie James's Fish , to enthusiastic applause from the audience. Charlie said she was delighted to have won the award. The Phoenix Book Award promotes reading for pleasure among Year 6 and Year 7 pupils in the London Borough of Lambeth. Inaugurated in 2007 by the Network of Educational Librarians in Lambeth, it is arranged this year by Lambeth Lead Practitioner Karen Hans and is open to all schools in the Lambeth area. We are very grateful to Lilian Baylis School for organising and hosting the finale.